These Pet Rescue level 280 cheats and tips will help you beat level 280 of Pet Rescue. 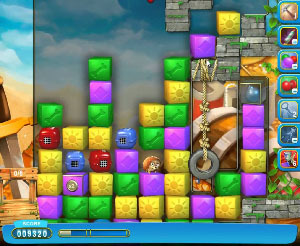 The objective of Pet Rescue level 280 is to save 5 pets and get 20,000 points. As you bring your animal cages down the level you’re also going to be pulling some encased bombs from ledges. Crack them open but resist the urge to blow them up. Bring them down to the lower stages of the level as a back up plan to help you clear blocks and drop animals. You’re also going to come across some balloons that match the same color as your animals cages. If you are struggling to open your cages with regular blocks, forget it. Your balloons can do the heavy lifting and free them up. This way you won’t have to moves. You’ll get a ton of bonus blocks here. To reach the 20,000 point goal, you must make the most of them. That means not using them in small matches. Instead save them for large matches that combine with other bonus blocks of the same color.